Happen to chance upon this cafe at Clarke Quay The Central. 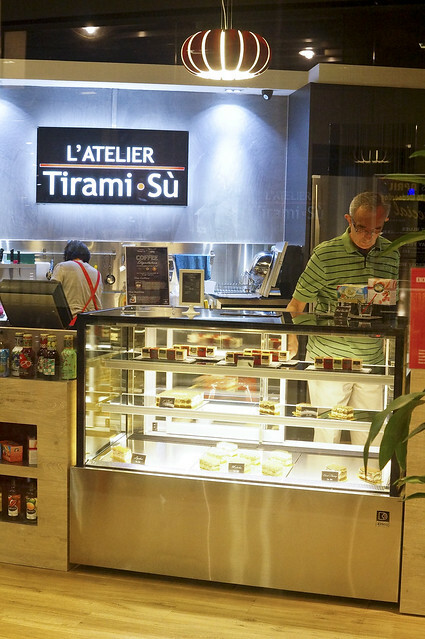 The first thing that caught my attention was their signage that reads “L’Atelier Tiramisu” and the small seating capacity of the cafe. My first thought was “If a cafe can survive just by selling Tiramisu, it must be really good”. That’s when i decided to try it out, and i am not disappointed. This is my second visit to L’Atelier Tiramisu. 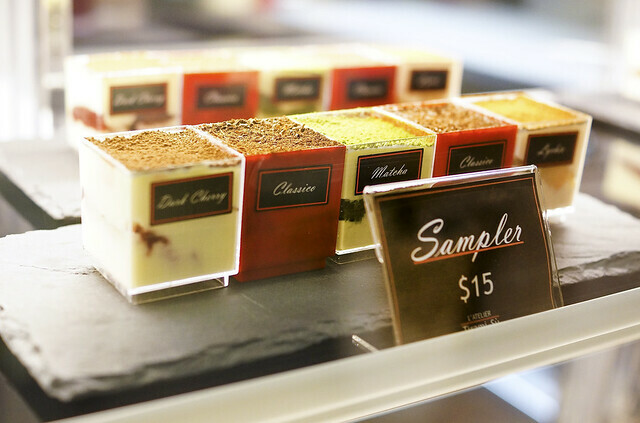 The Tiramisu comes in four flavors – Classico, Lychee, Dark Cherry and Matcha, or you can try the Sampler Set at $15.00 to try out all four flavors. Among the flavors, the Classico is my favourite. 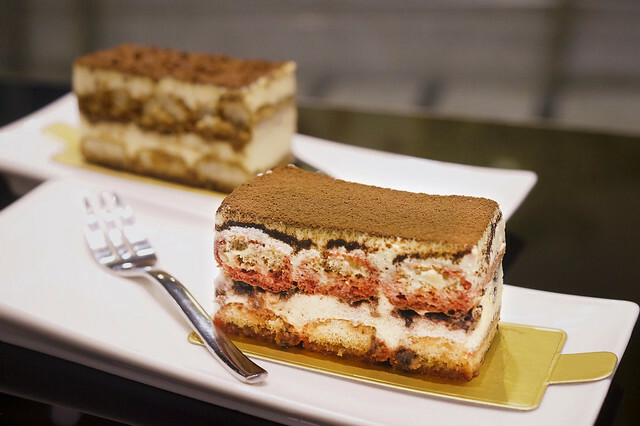 Their Tiramisu is briefly divided into five layers, with the top layer as the cocoa powder, the cheese cream, the coffee soaked biscuit (or the sponge cake), another layer of cheese cream and the bottom layer of biscuit. The biscuit at the bottom layer taste a little sweeter and is not as wet as the top layer. The most distinguish taste of this Tiramisu is it’s really moist biscuit center that is soaking wet with coffee and i can taste the sweet coffee aroma from every bite. I also like the moderately sweetened Mascarpone cheese cream very much. The proportion of the cheese spread over the two layers are just good enough to complement the bitter taste of the coffee. A piece of Tiramisu cost me $6.80 which i thought that it’s well worth it. I tried the Matcha flavor in my first visit and i am having the Dark Cherry this time round. The layering of the cake is similar to the Classico just that they swap the coffee to cherry juice with some very fine fruit pulp, i think. L’Atelier also added a thin layer of icing sugar on the top of the cake before ending off with the layer of cocoa powder. I personally prefer something a little bitter than a tinge of sour taste so my vote goes to the Classico. 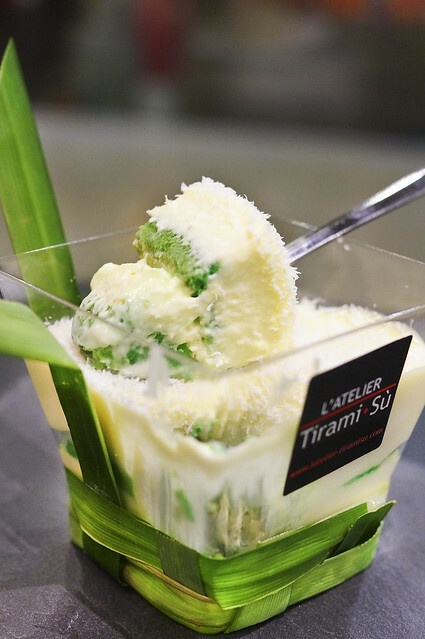 L’atelier had launched a new flavor today – The Pandan flavor. This time, it does not comes in slices but in a cup. The price is $7.80, a dollar more than their normal range. To be honest, this cake surprised me. As always, their Tiramisu is really moist, with added coconut rum, and they are rather generous with the mascarpone cheese. For this new creation, there is an additional layer of crispy chocolate center well hidden within this cake and i was surprised by this. I thought i tasted Milo powder, though the lady boss said that this is a layer of Chocolate Biscuit. L’atelier then finished the cake with a layer of coconut flakes. 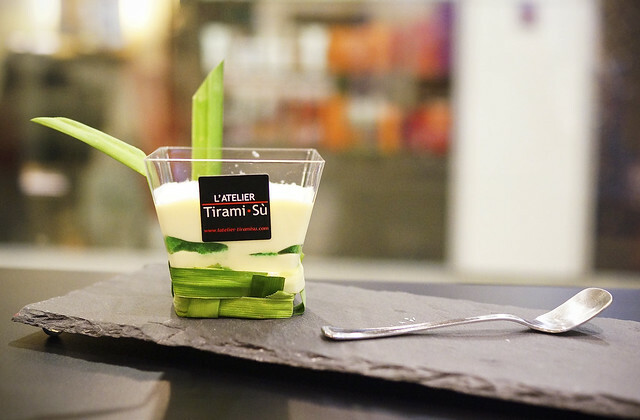 The two cake layers is infused with the sweet aroma of Pandan which goes really well with the mascarpone cheese. The layer of coconut flakes add an extra crunch to the overall texture. I thought the best way to eat this cake is to eat all the layers in one mouthful to savor the flavors and different texture all at once. If you are someone who like Pandan Kway or coconut, i think this will be a hit for you. I was asking the lady boss why was Pandan selected among all the available flavors and her reply was that she hoped to come up with a very localised flavor. She elaborated that she took three months to perfect this recipe and i think she did a pretty good job. I also finally tried their Lychee Tiramisu and completed the full set of flavors! After having the Pandan Tiramisu, the Lychee Tiramisu appears as slightly less impressive, thought it’s still rather good. There are some lychee meat and juice mixed into the cream layers between the sweetened sponge layers and finish with chocolate sprinkle and cinnamon powder. 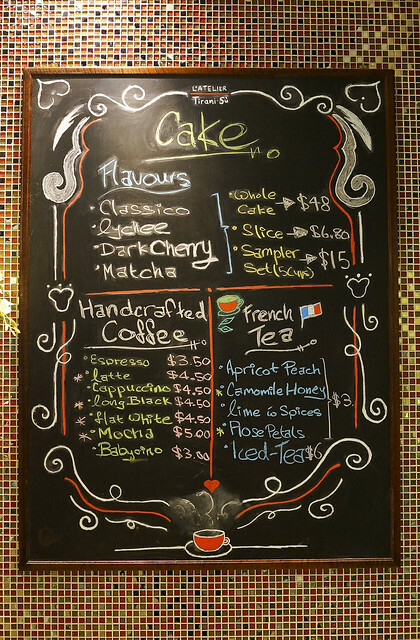 If you ask me my order of preference, it will be – Classico, Pandan, Lychee, Dark Cherry, Green Tea (sorry!). I am quite sure that this second visit will not be my last visit to L’Atelier cus i have yet to try out the Lychee Flavor. 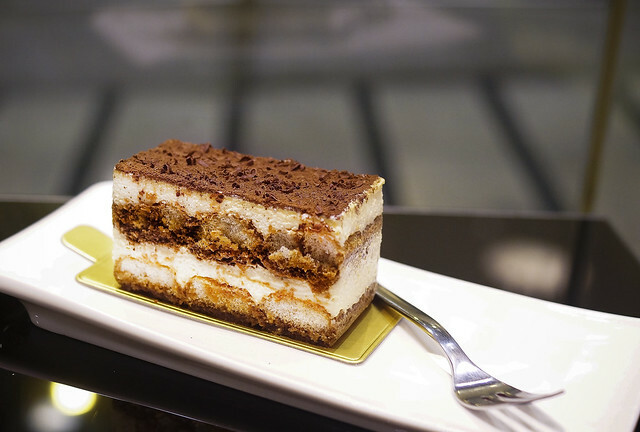 The portion of L’Atelier’s Tiramisu Cake is just nice, not too big, and not too small, which makes it the ideal dessert after a meal. 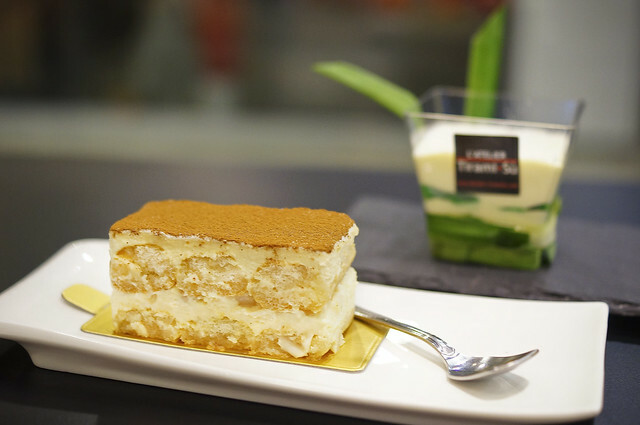 No matter how full i am, i think i should be able to squeeze out a little stomach space for a L’Atelier Tiramisu.